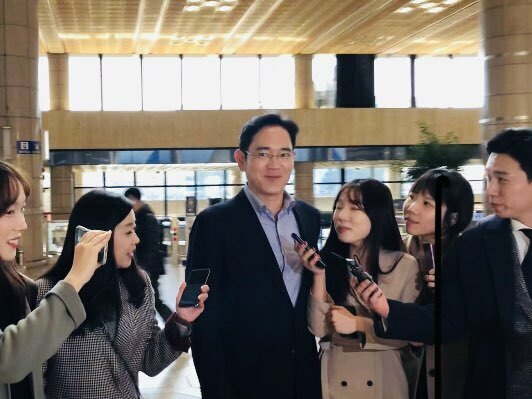 Lee Jae-yong, heir and vice chairman of Samsung Electronics, on Tuesday left for Hanoi with a scheduled meeting with the Vietnamese prime minister, possibly on making new investments in the country. The Samsung heir’s two-day visit to Vietnam is expected to serve as a critical chance for the tech titan to mainly revise its smartphone business, the competitiveness of which is on the wane in the global market in the face of rising Chinese rivals. Regarding the Korean chaebol’s visit, speculation has grown about upcoming business expansion plans for the Southeast Asian market compared to India, where Lee had visited earlier alongside Korean President Moon Jae-in on his state visit in August. On the first day of the trip, Lee is scheduled to meet with Vietnamese Prime Minister Nguyn Xuan Phuc and take a tour of Samsung’s smartphone, display and battery production lines located in Bac Ninh. Samsung runs two smartphone factories in Vietnam that combined account for producing around 150 million units a year. In the meeting with top Vietnamese government officials, Lee is also anticipated to discuss increasing investment in the country, including construction of another smartphone factory there, although the company declined to comment on it. Some in the industry view the latest visit as a reasonable occasion to deal with Samsung’s possible relocation of its smartphone plant in Tianjin, China, where the Korean tech giant is struggling to break into the market’s top five. “Lee’s visit could be aligned with Samsung’s plan to move the China plant to Vietnam as part of its plan to renew the smartphone business strategy,” said an industry official. Depending on the Samsung heir’s decision, the production volume of Samsung smartphones in Vietnam and further in Asia could increase or falter, according to market watchers. Among Samsung CEOs of the semiconductors, mobile and IT communications and consumer electronics divisions, Lee Dong-hoon, CEO of Samsung Display, accompanied the heir on his trip, raising possibilities that Samsung could invest more in the display business in Vietnam along with the smartphone business.